This is a fun film with a quirky sense of humor. One that hopes to be compared to Napoleon Dynamite while playing homage to Harold and Maude. With a title that pokes fun Pirates of the Caribbean. While not quite as magnificent as the first two films, certainly a much better film than the latter. In fact, whereas I couldn't bring myself to watch the sequel of "Caribbean," I would be delighted to see the sequel of "Great Salt Lake." The film takes place in modern day when two Utah residents decide it's time to come out of the closet and live in the US as pirates. The two immediately endear us, they're likeable, well acted pirates. The rest of the characters in the film are equally odd and enjoyable. The script has very good dialogue and twists I'd never have predicted. And the direction keeps it all rolling and afloat without delay. And of course, it's funny. We laughed out loud. As many of you know, technological advances in video have made a great many more indi films possible. While that's a good thing, the negative side is a great many more less than desirable films are out there. Let me assure you, this indi is not only a better quality script, but also better quality production than a great many large budget studio films. It�s a bit of a hidden treasure in its own right. A very strong B+. 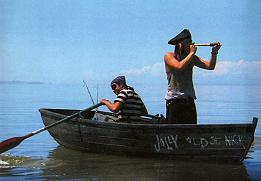 Pirates of the Great Salt Lake. Copyright © 2006. Starring Kirby Heyborne, Larry Bagby, Trenton James, Emily Tyndall, Joyce Cohen, Michael Christian, Morgan Lund, and Steve Anderso. Screenplay by E.R. and Nathan Phillips. Produced by Nathan, Christian Vuissa and E.R.